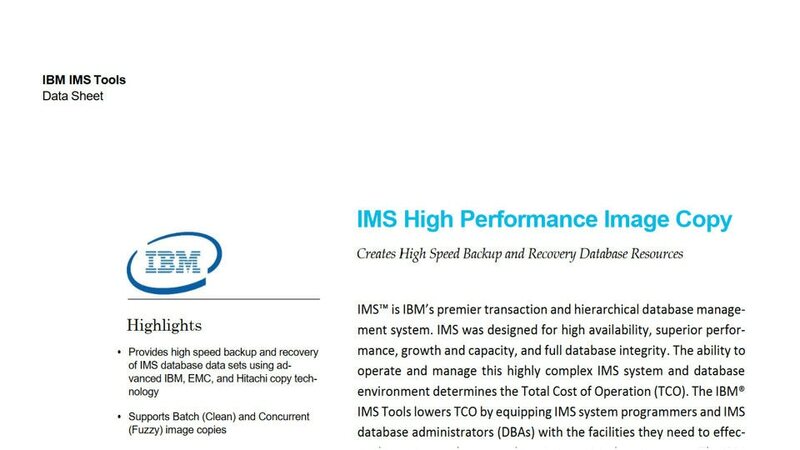 IBM® IMS™ High Performance Image Copy for z/OS® provides high-speed database copy and recovery features for the rapid backup and recovery of database data sets. It automates the error-prone manual operations normally required to create IMS image copies. It helps you speed database backup and recovery time by supporting quick shots of image copies and restarting methods. IMS High Performance Image Copy reduces the unavailability time of database data sets. Automated operation capabilities takes the database offline before taking a batch image copy and restarts it after the process. IMS HP Image Copy reduces running time by creating image copies for more than one database data set. It also decreases the time a database is unavailable during image copy and recovery. IMS HP Image Copy requires less manual work for controlling output image copy data sets by using a naming template. It minimizes manual database stops/starts with IMS Tools Online System Interface. By stacking the output of the Image Copy function, IMS HP Image Copy decreases the number of tape volumes that are used and reduces operational costs. IMS HP Image Copy stores reports in a centrally managed repository. It collects database statistics and stores them in a central repository for use with other IMS tools or products.